Settings of the work with Psi Psi++! AQ about settings of encrypted connection Safety jabber – Psi Psi++ is given further. This scheme will work on any client, which supports OpenPGP. Try to offer your interlocutor to install Safety Jabber! 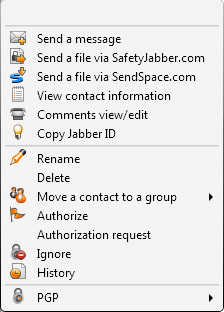 Setting of connection Safety Jabber -> Psi, Psi ++ and other clients on the base of PGP. 1. Choose a contact, with which it is necessary to set secure connection. 2. Press the mouse right button on a contact (Picture 1). 1. Choose “Send my public key”. 3. Send your public key to the interlocutor. It is necessary to give the key to the interlocutor, with whom you are setting encrypted data line. You should have its PGP key for successful creation of connection. Mainly it is sent in an open form through a dialog box. 1. Press the right mouse button. 4. Put the interlocutor’s public key into the window. Check if connection is encrypted by the sign in the dialog box.